In Leonard Cohen’s Beautiful Losers he writes, “Reality is one of the possibilities I cannot afford to ignore.” In Anne Emond’s feature film directorial debut, Nikolai (Dimitri Storoge) is a beautiful loser, but he can somehow ignore all the realities of his life. He is all of thirty-one and leads a simple life punctuated by simple meals. He enjoys reading the great authors but never seems to be able to finish the novel he has started. Unable to live within the confines of any schedule he knows he is unable to work and totally unemployable. Although he has big plans and great ideas inevitably and invariably in spite of himself, he loses sight of their possibilities before they materialize. Meanwhile Clara could never survive his feckless existence. While not particularly driven, Clara is easily able to live a double life. By day she teaches a Grade 3 class but come nightfall she is transformed. Clara is a party girl. She goes out every night, gets drunk, takes drugs and sleeps with men, women or both. Then their paths cross for a one night stand. 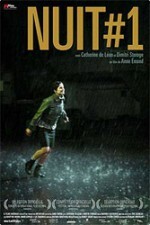 Nuit # 1 was the winner of the Shaw Media Award for Best Canadian Film at the 2011 Vancouver International Film Festival.